Some of Stowe's pleasures are best appreciated during warm weather, and in winter there's always great skiing. At 4,393 feet (1,339 meters), Mansfield is the highest mountain in Vermont. Much of it is protected from development in the 34,000-acre (13,760-hectare) Mount Mansfield State Forest, which includes Underhill State Park. You can drive to the top of Mount Mansfield on the Stowe Mountain Resort Auto Toll Road, climbing even higher into the mist, past bunches of exotic wildflowers, feeling the air get cooler. Both the gondola and the toll road are open daily from mid-June through mid-October, weather permitting. Underhill State Park has four hiking trails on Mount Mansfield, joining the route of Vermont's Long Trail which follows the ridge line of Mount Mansfield above tree line. The Sunset Ridge Trail is the most popular, taking you to the mountain's summit in 3.2 miles (5.15 km). Note that these trails are for experienced hikers in good condition. They are hiking trails, not walking paths. The Stowe Recreation Path is a 5.5-mile (8.85-km) paved greenway path right from Stowe village north up the valley toward Mount Mansfield. Used by walkers, joggers and bicyclers, the path is easily accessible. Parts of it are reserved for walkers and joggers only. The Stowe Country Club at Stowe Mountain Resort has an 18-hole golf course with all facilities. Stoweflake Mountain Resort & Spa has its own 9-hole course. Many of the larger resorts at Stowe have their own tennis courts, and some offer lessons and tennis camps. It's no exaggeration to say that something's always happening in Stowe in June, July, and August: antique car rallies, horse and dog shows, a craft fair, wine tastings, concerts, theater, even a fiddlers' meeting, and a surprisingly authentic Oktoberfest (in October, natch) crowd into the schedule. 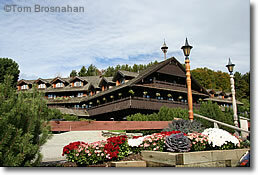 The Trapp Family Lodge, Stowe VT.